Want to see inside? Take our 25 point online tour. 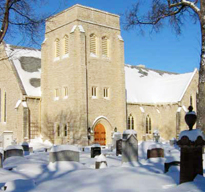 Our cemetery is the final resting place of many of Manitoba’s prominent historical figures. For the tales attached to the tombstones, take our cemetery online tour. If you would like a guided tour of the Cathedral and its historic cemetery, call ahead (586-8385) or e-mail and book a time. Tours can be arranged for Monday through Saturday between 10:00 am and 3:00 pm, and for Sundays between 12:30 pm and 3:00 pm.